The up and coming Primapoker network is a collection of "sister sites" sharing the same players and running the same software. While the individual casino will handle deposits, cashouts and their own promotions and bonuses, you will be playing at the same tables regardless of which "skin" you are using. The following sites are all Primapoker portals. The well known "Hendon Mob" (British players Barny Boatman, Ram Vaswani, Ross Boatman and Joe Beevers) is actively involved in promoting Primapoker. The four make regular appearances in both tournaments and ring games. Developed by Microgaming Inc., the program has excellent statistics tracking options and keeps track of the size of the pot and number of players at each stage of the hand. How many players stayed to see the flop? The turn? The river? This is very useful in making decisions. 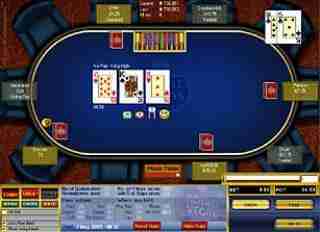 Included is playcheck, a web-based utility which can be accessed from within the poker software. It provides players with a detailed, bank-like statement that catalogues each and every wager. Results can be filtered by date, game type and many other criteria. Bad Beat promo - Four of a Kind or better, is beaten. The loser of the hand receives 50% of the progressive bad beat jackpot, the winner gets 25%, and the remaining 25% is split among the other players in the hand. Magic Hand promo - From time to time Prima Poker management picks a hand number at random in advance and declares it a Magic Hand and establishes what the prizes will be. When that magic hand is dealt, the winner of the hand wins the main prize and all other players in the game each get a second bonus amount. High Hand - Each day, the person with the highest Hold'em hand played on the network wins an extra bundle of cash.